We are so confident that you will find Pico to be the easiest to use, most compact and most energy efficient (electricity and water) system you have ever used that we will take it back and cancel your invoice if you don’t agree. The Pico pure water system has gone global! We’re proud to see the Pico system being displayed at Pittcon 2018 in Orlando, Florida. If you’re lucky enough to be in attendance this week, visit Stand 1404 for more details from the team. They will be happy to answer any queries you may have as well as demonstrating the system. We hope to see you there. When working in laboratories and hospitals, it’s crucial that any contaminants found in water are removed immediately, before they cause any damage. Each impurity carries its own risks to chemical and biological research, not to mention the detrimental effect they cause to the quality of pure water. 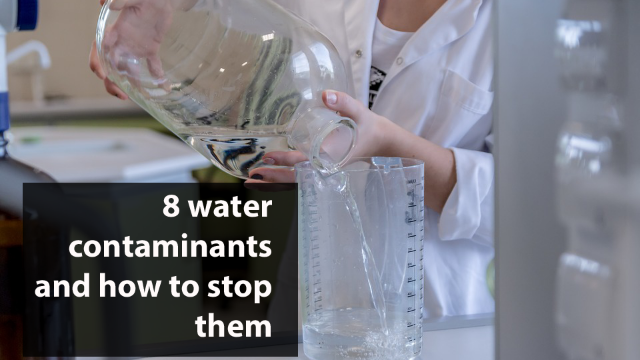 In this article, we discuss the 8 most common water contaminants and how to prevent them. The ‘Pico’ is the latest addition to the Triple Red range of high quality water systems which are manufactured in the UK to ISO9001:2015 certification. This complete, “all in one” water system provides general laboratory water with many unique features. Read more here. There are four levels of water purity recognised in the water purification industry, each of which are used for specific applications in laboratories. The quality of water is defined through a series of measurements of conductivity (µS/cm) or resistivity MΩ-cm), Total Organic Carbon (TOC) in parts per billion (ppb), and bacterial count (CFU/ml). Here we explain the four types of water used in laboratories, as well as the processes and properties of each type.